I love Medieval European history the most, however. I am very knowledgeable about many things (including linguistics). I can speak English (obviously) and German, and can read and write Latin well enough to understand most classical texts without difficulty. 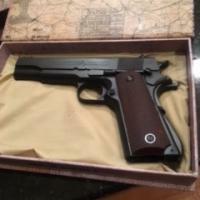 Another GBB Thompson? Or a WE in Palco clothing. The WE SVD 'Premium' version had a milled steel receiver. Hopefully they release a forged steel receiver version, like the real M1A1 Thompson. I kind of assume they will. Unless they use a similar system that WE did with the L85 (nozzle return springs). Then it would probably be more complicated. Technically the WE L85 can allow full travel (real SA80s stop a cm or two short of the charging handle disassembly slot), but it will lock up after a shot if the nozzle return springs (which also cut into and make quick work of the bolt carrier) are removed. LCT is the OEM for a large amount (if not all) of the GHK AK series externals. I know there are significant differences between certain items though (such as fixed stocks, which are mounted completely differently than on AEGs). LCT obviously manufactured the GHK AKM stock (as its finish are practically identical), but it is not compatible with their AEGs (GHK AKs use a stock tang with two mounting points for securement, which is accurate for stamped steel AKs). I think there are slight differences between the LCT and GHK receivers, although it is clear that LCT OEM'd them as well (I know that the Izhmash markings on the left end of the receiver on the GHK AKM are different than on the LCT AKM). I'm going to emerge from the dead at this point, and say, yes, there was a full travel kit being developed, and it released a few months ago. I own a GHK AKM with one installed. It is awesome! I can ask W&S if they have any interest in developing a full travel kit for this, if it turns out to really be short-stroked. The SG 552 irl does not travel as far back as an AK bolt carrier though (AKs travel over 10cm back, which is really a lot for an intermediate cartridge - partially due to the recoil rod and long stroke gas design). ######. What else is new? I am pretty interested in one of these for the 1911, mainly so I can actually install the Guarder firing pin on my Ino (which uses KJW-spec internals, and because of that, the blowback housing screw is too long and is incompatible with the firing pin set. Of course, increased efficiency is always great (although I have managed to obtain good enough efficiency with the pistol on gas magazines and Guarder Power Up gas, plus a bunch of internal *suitcase*). The Stratos for the 1911 would be steel, right? I would kind of need it to be made out of steel for it to be of interest to me (otherwise it is a downgrade from my pistol's steel blowback housing). What happened to the KWA M1A1 Thompson? What about the KWA MP40? Did those get abandoned, or could they possibly show up again? That is very helpful. Thanks! I find it kind of insulting that the GHK AUG lacks a lot of these steel parts. For the price, you would think it would have a lot of steel components?!! Are there any manufacturers that make a steel bolt carrier for it? Hephaestus and a few others I know make a steel outer barrel.